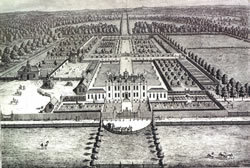 Kneller Hall and its formal gardens. In 1857 the Royal Military School of Music was founded at Kneller HallKneller Hall was named after Sir Godfrey Kneller a celebrated painter who came to live here nearly 300 years ago. In 1854 Queen Victoria decided to hold a review of all the regiments in the British Army. This was part of her birthday celebrations. At the review, bands from different regiments tried to play 'God Save the Queen' together. It sounded terrible because they were not used to playing together and had not practised together. They couldn't keep in time with one another and they all played in different keys. 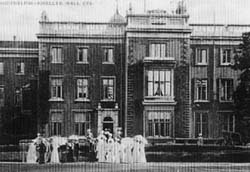 Kneller Hall in the 19th century. The Duke of Cambridge was the head of the army. He decided that all the army musicians should be trained to the same standard. He decided to start a military music school where they could all learn to play. The house had been a teacher training college for some years, so it seemed a perfect place for the new music school. The school opened in 1857. It is still there today.